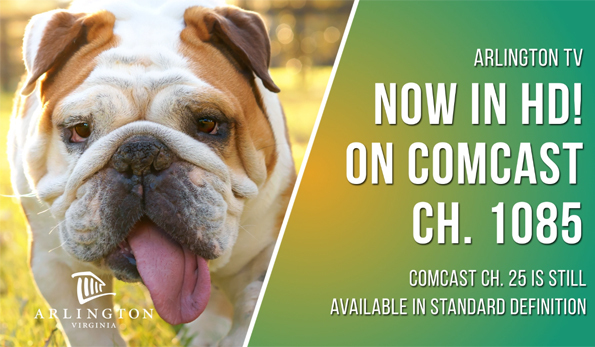 You can now watch Arlington TV (ATV), the County’s government cable channel, in high definition (HD) on Comcast Xfinity. 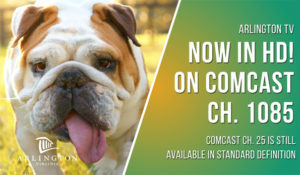 From live County Board Meetings to original programming about Arlington, viewers with HD sets can now watch the same programming on Channel 1085 on Comcast Xfinity’s HD tier. The County’s standard definition channel will remain on 25, while the second channel, 74, will be “retired” to make room for the new HD option. Channel numbers on Verizon FiOS remain the same, at 39 and 40. Since 1981, ATV’s mission has been to provide informative, educational and entertaining programs about Arlington County services, programs and people. It airs and streams live coverage of County Board meetings, work sessions and selected commission meetings. The Community Bulletin Board runs announcements and information about County services. ATV also has upgraded cameras, lights, and graphics for the County Board Room, helping ensure presentations and speakers appear more crisp and clear than ever. All of ATV’s programming, including live streaming, is available on its YouTube channel — where you can click on the red “Subscribe” button to receive updates on the latest videos. ATV also streams online on the County website. View the programming schedule.